For sweet satisfaction and easy preparation, there's nothing like a plate full of brownies, bars or squares fresh from the oven. In the world of baking, these are the ultimate comfort foods, evoking wonderful memories. 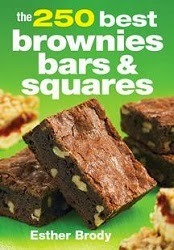 Best of all, brownies, bars and squares are so easy to make. For many recipes, you simply mix up the dough in one bowl, put it into a square or oblong baking pan and bake! Bestselling author Esther Brody brings back all of that homemade goodness in this outstanding collection of fully tested recipes. You'll discover many familiar recipes, as well as new recipes that are sure to create warm memories for your family and friends. My Thoughts: I love baking brownies and typically bake up a batch every 2-3 weeks. I love that I can usually whip together all of the ingredients in one bowl, pour into my baking dish, plop it into the oven, walk away and come back when they are done. Unlike cookie making where you dirty a lot of bowls, utensils and you have to stand there taking sheets in and out of the oven for an hour. Brownies are KING for people like me who are super busy and don't have 2 or 3 hours to be in the kitchen baking. I decided to make the Classic Chocolate Nut Brownies which are featured on page 17 in the cookbook. For this recipe you only need 7 different ingredients and the author gives you the option of making them with or without frosting on the top. It took me about 7 minutes to prepare them and about 30 minutes of baking time. In less than one hour, we had warm delicious brownies to enjoy! A lot of time when I make a classic brownie like this one, we like to spoon vanilla ice cream on top. Yes, brownies ala mode! They were really easy to prepare, baked up quickly and tasted delicious! Within the next two or three weeks when I have more time, I want to try out the Glazed Boston Cream Bars recipe that is on page 145. Oh my gosh...they sound delicious and since we love Boston Cream Pie and Cake, I am sure we will love these brownies once I get them made. This is a great brownies, bars and squares cookbook with a lot of variety. You can find your classic recipes and recipes with a new twist. The author did a great job at giving us such a wide variety to choose from. You can head on over to Robert Rose and take a look at all of the fabulous cookbooks they have to offer. Giveaway: One lucky winner is going to win "The 250 Best Brownies, Bars & Squares" cookbook from Robert Rose. Value $19.95. A great book to have this holiday season! Giveaway Details: This giveaway is open to residents of the USA & Canada ONLY who are age 18 and over. Please read the Terms of Service and Disclaimer Policy before entering. You must be a PUBLIC FOLLOWER of this Blog to have your entries count in my giveaways. (Follow via Google Friend Connect) All non-blog followers will have their entries disqualified after the giveaway closes. This giveaway will close on November 19th, 2013 at midnight EST time. 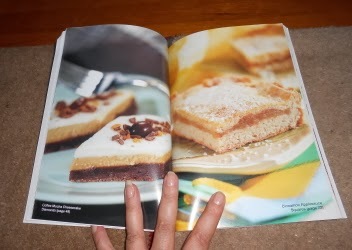 I would like to make the Cinnamon Applesauce Squares. 300 Best Casserole Recipes. Sounds like some great ideas there. Darlene Demell I am a GFC follower. I added your button on my side bar. i would love to get the THE COMPLETE TRAIL FOOD COOKBOOK because I love outdoor cooking!! I'd like the 300 Best Casserole Recipes. I'm always looking for new casserole recipes. I entered the TCC Leslie Sansone Walk DVD Giveaway. I entered the Perfect Occasion Gift Basket giveaway on TCCs. I entered the Holiday Gift Guide: Stainless Steel Glass Panel Toaster by Kalorik $99 Value giveaway. I entered the 250 Best Cookies Recipes giveaway. I would like the Healing Herbs book. I entered the multiplication slam on TCC. I entered the TCC PinkBlush Maternity Clothing giveaway. I entered the Home Alone giveaway on TCC blog. I entered the giveaway for the Potted Holiday Tree.